Killer whale watching is extremely exciting off Northern Vancouver Island in British Columbia, Canada, especially when they decide it is time to display their tail. As one Killer Whale keeps to himself and leisurely swims along, another one decides that it is time for some fun and gives passengers aboard a whale watching trip off Northern Vancouver Island, a tail display. As the whale brings his tail out of the water a fountain of water trickles back onto the ocean's surface. 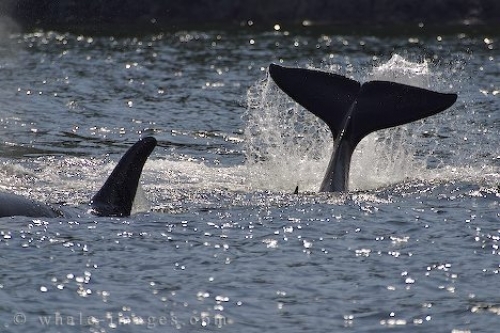 A tail display is one of the common behavioral traits of the Killer Whale seen by visitors to Northern Vancouver Island every year. As this whale shows off the black on the upper surface of its tail, the underside is mostly white with the edges being bordered in black. A Killer Whale will use its tail flukes as a way of communicating with other members, after resting or as a sign of aggression. They will slap their tail against the surface of the water making a very loud sound that can be heard for quite a distance especially if the ocean is calm. Killer Whale watching season off Northern Vancouver Island is at its best during the summer and fall seasons when these whales follow the salmon run and are regularly seen in these waters. Watch for a variety of displays from the Killer Whales such as tail slapping, pectoral fin slaps, breaching, spy hopping, foraging and socializing which can happen at any given time. It is amazing to watch this beautiful sea animals living free in the beauty of their natural environment.